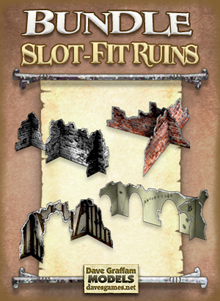 This bundle includes all of my sets of slot-fit ruins models. These are double-sided ruined wall sections that can be slotted together in countless ways, letting you create sprawling mazes of wrecked terrain. Tbe Crosspiece Ruins Set features solid wall sections, and the Crosspiece Ruins Set #2 introduces smashed-through areas for even more variety. 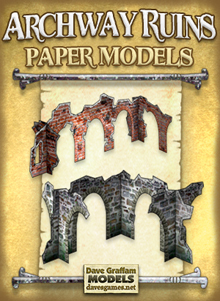 The Archway Ruins Set adds a classical or gothic flair to your ruined landscape. 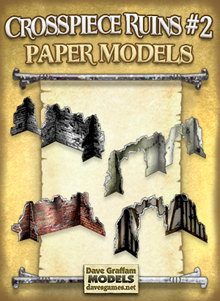 These paper model kits are easy to assemble, requiring just cardstock paper sheets to print on (110 lb. or 199gsm recommended), scissors, hobby knife, paper glue, aluminum ruler and cutting mat. Assembly time is just a few minutes per wall section. These models are designed at the popular 28mm-30mm gaming scale, and can be shrunk down to 15mm, 20mm or 25mm scales by simply adjusting the print size percentage on your printer. Tips and advice for altering the scale are included. 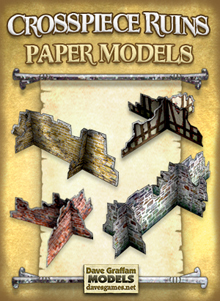 This set includes wall sections that can be assembled in a variety of ways, giving you lots of options for building endless mazes of ruined walls. The wall sections fit together with a simple slot-fit design, so thay can be reassembled in many ways. When your game is over, these pieces will all fold flat for easy storage and transport. These models feature multi-layered PDFs that offer a variety of skins. These texture layers can be mixed and combined in various ways, giving you control over the appearance of your model before your print it. This means you can create this model over and over, choosing a different look every time. It's many models in one! For your printing convenience, this kit includes 3 full sets of single-layered PDFs. These are ready to print right away, without involving any extra graphics or texture layers.